I read a very disturbing article recently, which stated that a large percentage of the clothes we could donate for reuse ends up in landfills. This is disturbing because a lot of the materials do not deteriorate naturally, and it causes a big problem where they are buried. Of the clothing that does get donated, much of it gets recycled for use in furniture fill and insulation manufacturing. I guess I was naïve to believe that the fashion treasures I donate end up making someone else look fabulous! I have discovered in recent years, however, that Dutch designers are, among many, very active in the area of recycled interior design. Tejo Remy (born 1960) is certainly a pioneer in this effort. Simple solutions to structural problems are a feature of Remy’s designs. He takes everything available in the everyday world as “media” for his designs, and comes up with stunningly simple but also ingenious solutions to interior design. Imagine a living room with a set of these obviously comfortable side chairs. It sure beats the cold, soulless Barcelona furniture of Mies van derRohe (1886–1969), which has had a resurgence in popularity among those who weren’t around for the first incarnation of the style. 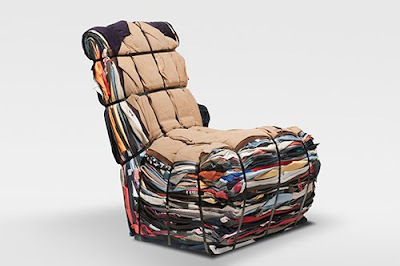 Although these chairs were called “rag chairs,” they are comprised mostly of discarded garments. Even though Remy no longer works for the company, Droog still markets these chairs and offers the customer the ability to add their own discarded garments as part of the chair. If this is not a comment on our throw-away society, I don’t know what is! Remy studied at the Utrecht School of the Arts in the Department of 3D Design. Sustainability is the guiding principle behind his designs, recycling everyday objects in his interior work since the early 1990s. This was the period just coming out of the “greed decade,” as I call it, or the Reagan Era. 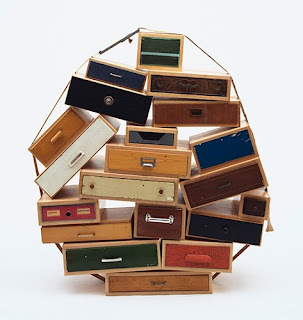 I’m pretty sure you’re familiar with another of his landmark designs, the You Can’t Discard Your Memories chest-of-drawers from the same year as his Rag Chair. It’s simply brilliant. The only downside to “sustainability” and “recycling” is that one pays dearly for the cachet of the designer’s name. The same is true with the furniture designs of Philippe Starck (born 1949), who employs discarded industrial materials in many of his designs. Frank Gehry (born 1929) explored furniture made of corrugated cardboard, which are over the moon in price. The Rag Chair is listed on Droog’s website for €2694.21! May I just say something everyone’s probably thinking: Why is something so good for the planet (and so visually stunning) so expensive?